The Breeders' Cup Juvenile Turf Sprint is making its debut at this year Breeders' Cup World Championships and will be race five on the day dedicated to promoting "Tomorrow's Stars." The 5 1/2-furlong race with a million-dollar purse is open to all 2-year-olds. The Juvenile Turf Sprint is a relatively new concept in American horse racing. There are few graded stakes turf races for 2-year-olds and the best will be running two turns in the Juvenile Turf. However, in Europe, there are several group stakes races for 2-year-olds at sprint distances. European 2-year-olds may have also raced in several group stakes already, such as So Perfect and Soldier's Call. Most American 2-year-olds have run in two races, one of those being their maiden. While most American racing fans recognize Chad Brown as being a great trainer of turf horses, Wesley Ward has six horses among the pre-entries for the Juvenile Turf Sprint with four making the draw. One of those is filly Shang Shang Shang, a filly who beat the boys at the Norfolk Stakes at Royal Ascot and earned herself a "Win and You're In" spot. 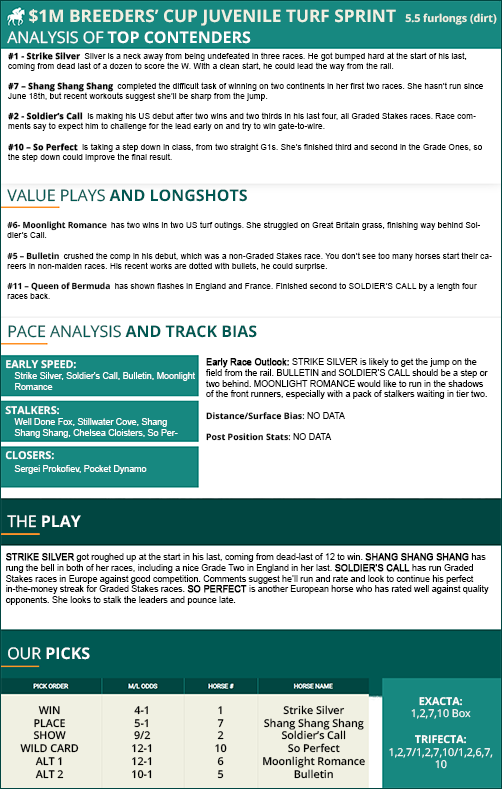 Our 15-page Breeders' Cup Wagering Guide is ready for download and here is a sample so you can see the time and quality that goes into making such a guide. With a PRO monthly subscription, you get the full guide plus our full card picks for both days of the Breeders' Cup, all other tracks and races for a month PLUS our 54-page wagering guide on how to best play our picks! Purchase your PRO monthly package here.